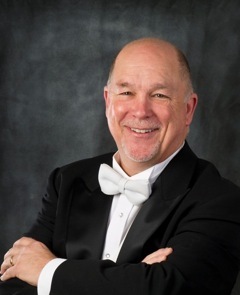 Dr. John Bell, Professor of Music and Director of Bands at SIUE, conducts the Wind Symphony and Chamber Winds, teaches conducting and music education courses, and coordinates recruiting and auditions for the Department of Music. Additionally, he is the Music Director of the St. Louis Brass Band in St. Louis, Mo. Dr. Bell earned doctorate and master’s degrees from the University of Illinois and a Bachelor of Music Education degree from Louisiana State University where he served on the LSU Golden Band From Tigerland staff. Prior to his present appointment, Dr. Bell was Associate Director of Bands at the University of Northern Colorado, where he founded and directed the university’s marching band, the Pride of the Rockies. While in Colorado, Dr. Bell was appointed music director and conductor for the Rocky Mountain Brassworks in Denver. Seven years of Dr. Bell’s career were spent in the public schools of suburban Chicago, where he was Director of Bands and Chair of the Department of Music at Willowbrook High School in Villa Park, Ill. Under Dr. Bell’s direction, The Southern Illinois Wind Symphony has premiered 16 works for wind band; appeared as the only U.S. collegiate wind ensemble to perform at the 2011 WASBE conference in Chiayi City, Taiwan; toured Europe; performed twice in New York City’s Carnegie Hall, at state meetings of the Illinois Music Educators Association, and at divisional conferences of the North Central and Southwest Divisions of the College Band Directors National Association. Additionally, they have mounted eight compact disc recording projects. All recordings are available on the Mark Masters recording label. Bell’s research interests lie in the work of famed choreographer Rudolph Laban and the application of his theory of movement to conducting pedagogy. His workshop “The Choreography of Conducting” has been warmly received. Dr. Bell is an elected member of the prestigious American Bandmasters Association and the American School Band Directors Association. He also holds memberships in Phi Mu Alpha Sinfonia, the College Band Directors National Association, the World Association for Symphonic Bands and Ensemble, National Association for Music Education, and Pi Kappa Lambda National Music Honor Society. He has received the National Band Association’s Citation of Excellence and is a contributing author to the acclaimed series Teaching Music Through Performance in Band. In 2000, he served a conducting residency in Taiwan under the auspices of the Sirens Band of Taipei, where he presented clinics in rehearsal pedagogy and master-classes in conducting to Taiwanese educators. He served as the director of the Illinois Ambassadors of Music for their 16-day tour of Europe in 2012 and led this tour again in the summer of 2014. Dr. Bell was Brass Caption Head for the Cavaliers and the Blue Knights Drum and Bugle Corps, and has judged championships for Drum Corps International and Bands of America. He has adjudicated symphonic and pageantry events throughout the United States, Canada, Japan, and Thailand, and has conducted honors and all-state bands in Taiwan, Georgia, Kentucky, Illinois, Texas, Missouri, Pennsylvania, Wisconsin, Colorado and Nebraska.